LISBON, PORTUGAL: Situated by River Tagus, Lisbon is the capital of Portugal and a thriving European city at the edge of Atlantic Ocean. The history of this city can be traced as far back as to 7th century BC. It was severely destroyed by the big earthquake of 1755 which damaged majority of its structures. But today’s Lisbon is a lively and spontaneous place that attracts tourists from all over the world. Being so close to Spain you can see many similarities between these two countries in terms of their languages, cultures, and heritage though rivalry between these two countries is very obvious when it comes to sports and other things. There are lots of Islamic influences in Lisbon too (mainly architectures), since Moorish ruled this place many centuries ago and left their signs before leaving the Portuguese to themselves. 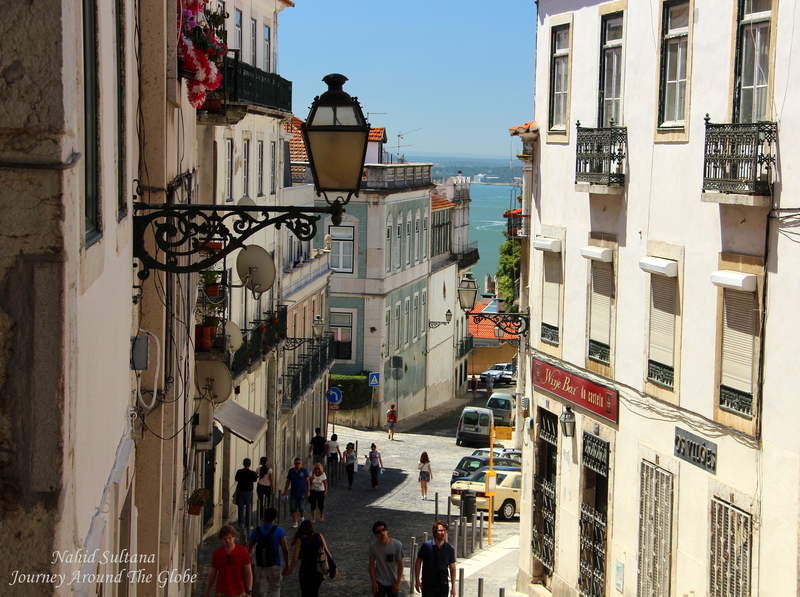 Lisbon is situated on seven hills, so there are lots of ups and downs all around the city. Many places have uneven cobblestone streets in the old town. Wear comfortable shoes if you are planning to cover the city on foot. Public transportation is good here too. There are metro, bus, tram, and boats available to take you anywhere in the city and beyond. Try to ride their historic small yellow trams on your way to St. George’s Castle or to Belem…but beware of the pickpockets there. TIME of TRAVEL: We visited Lisbon during the mid-June 2013. Temperature was extremely good…close to 80 degree Fahrenheit. It was nice to get a break from our wintry Belgium weather to a hot summer place. We still had our sweaters, because it gets a bit windy and little chilly after dark and near the waterfront. EATING and SHOPPING: Eating out in Portugal is very cheap and reasonable compare to many other European countries, even when you are eating seafood dishes. That’s a great news for us tourists, because you have to try Portuguese style seafood when in Lisbon…probably some of the best ones I had so far. 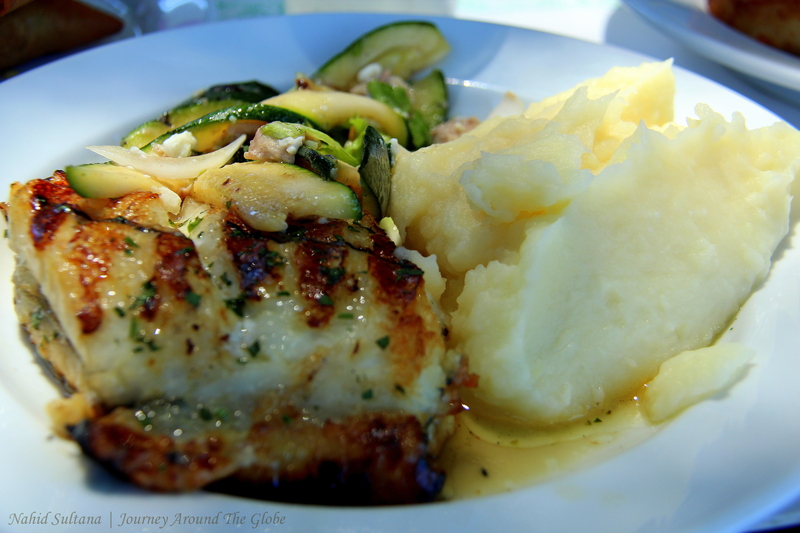 You can sit in a fantastic restaurant with a nice seafood dish and end up paying very little for a large portion. Also, many restaurants offer live fado (string instrument, very popular in Portugal) music on certain days. 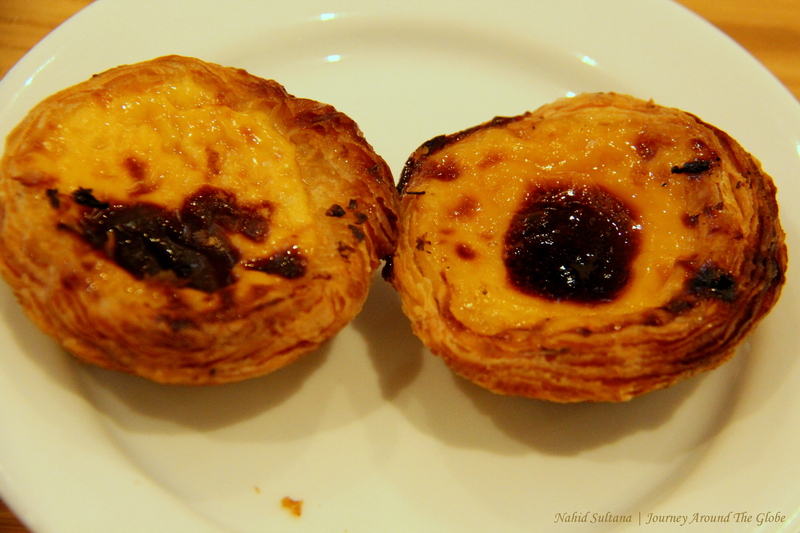 For dessert, Pastei de Nata is the best and most popular among the locals and tourists. It’s a custard tart on a crispy pastry…looks a bit like crème brule except on a pastry shell. I am a not a big fan of sweets, but I ended up eating few of those wherever I saw them. 1st day we ate in a restaurant in Alfama close to Lisbon Cathedral, known as Vossemece. Sardine is probably number one dish that most of the tourists try in Portugal and I tried my part of sardine on the very first day too. I am not a big fan of sardine and really don’t know how to eat one with bones and skins. Portuguese have their own style of eating sardine leaving the skin and bones intact and eating the flesh neatly. I ate it with the skin, it was salty and …very fishy…and never felt like trying another grilled sardine again during this trip. Tiles and ceramics are very popular souvenirs here. One thing we saw in EVERY store was many colors of roosters. 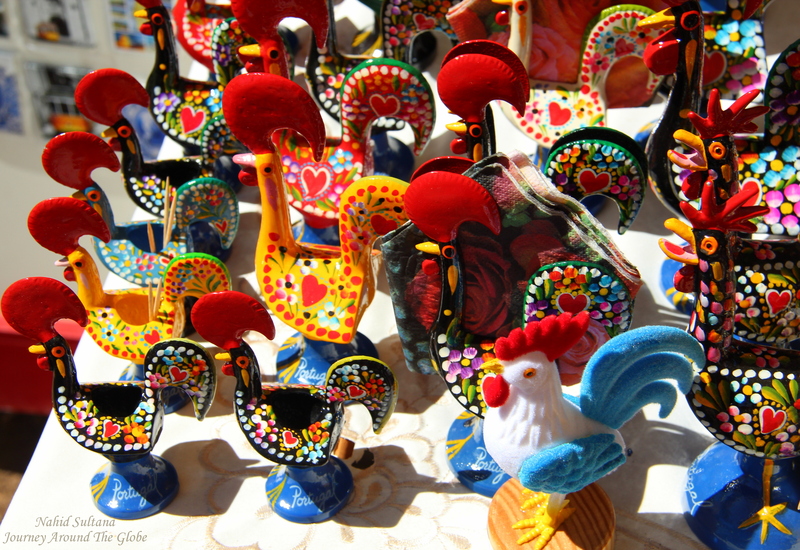 They have a legend that rooster brings good luck; I am sure you can find one that will suit your taste. Also, sardine is a popular souvenir to take back home too…but not the actual fish. You can get lots of goods with pictures of sardine here, like t-shirt, mugs, small replicas, and etc. PLACES WE’VE VISITED: We spent about two whole days in Lisbon. I wouldn’t say it was enough but nevertheless, we were able to hit most of the spots that were on our itinerary, except for Cristo Rei – a copy of the statue of Jesus in Rio de Janeiro. 1) ST. GEORGE’S CASTLE (CASTELO de S. JORGE): This Moorish castle is a national monument and a must-see in Lisbon. It has ruins of the former royal palace and small part of elite neighborhood. History goes that the fortification was originally built by the Arabs/Moors in the mid-11th century. When Dom Afonso Henriques, the 1st king of Portugal, conquest Liston in 1147, the castle went through its golden age as home for the royalty until the middle of 16th century. The Royal Palace suffered heavy damage in the earthquake of 1755 when most of Lisbon was destroyed. But unlike other palaces, royals never resided here, it was used more as a fortress. 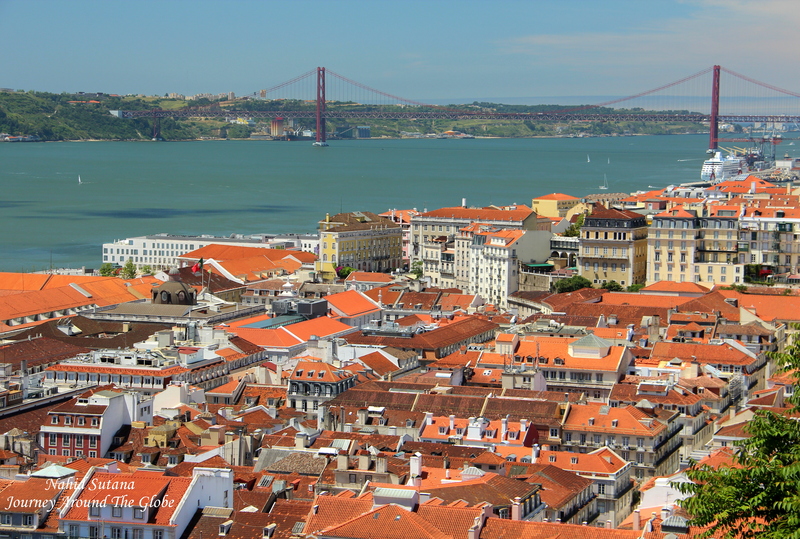 Being on a hilltop summit, St. George’s Castle is an outstanding location for majestic and unparalleled views over Alfama neighborhood – a historic old town of Lisbon, River Tagus, Cristo Rei on the other side of the river, 25th April Bridge, and overall Lisbon. This is a home of lots of stray cats and many beautiful peacocks. 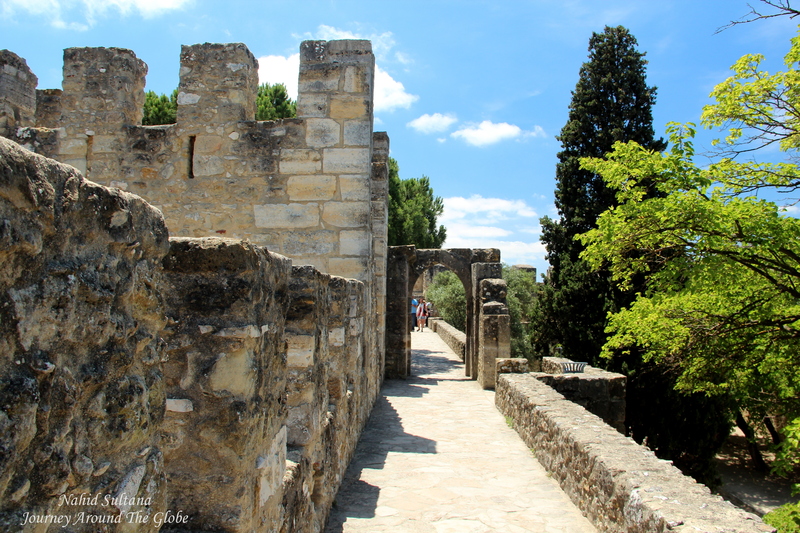 You can easily spend couple hours just wandering around the courtyards, climbing and walking on the old outer defense walls on some portion of the castle. Finally, don’t forget to visit the castle museum for some taste of the lifestyles from the past. From March to October the castle is open from 9 to 9 and from November to February it’s open from 9 to 6. It is 7.50 euro per adult and for a family of 2 adults and 2 kids below 18 is 16 euros. It covers the castle and its museum. Lisbon’s historic tram # 12 and 28 go to the castle, also bus # 37. 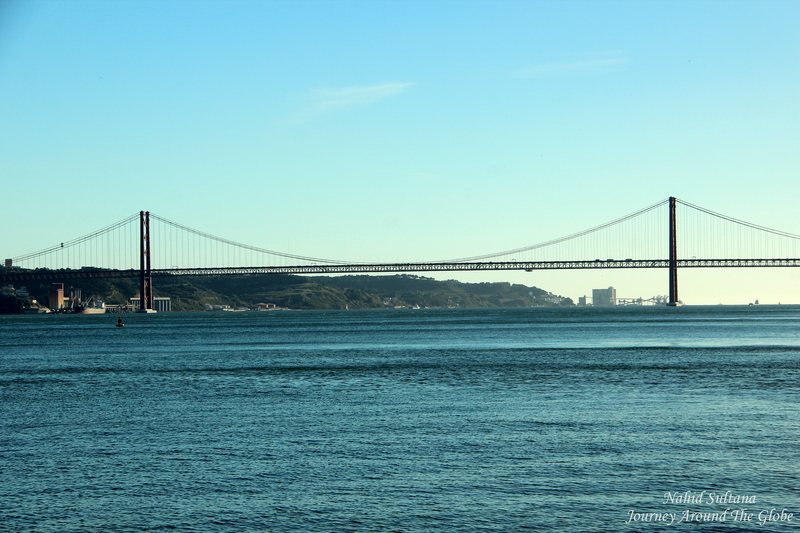 2) BRIDGE 25TH APRIL (PONTE 25 de ABRIL): This is a sister bridge of the San Francisco Golden Gate Bridge over Tagus River and was designed by the same architect. You can get a view of this bridge from many points of Lisbon but St. George’s Castle is probably one of the best places to see it from atop. 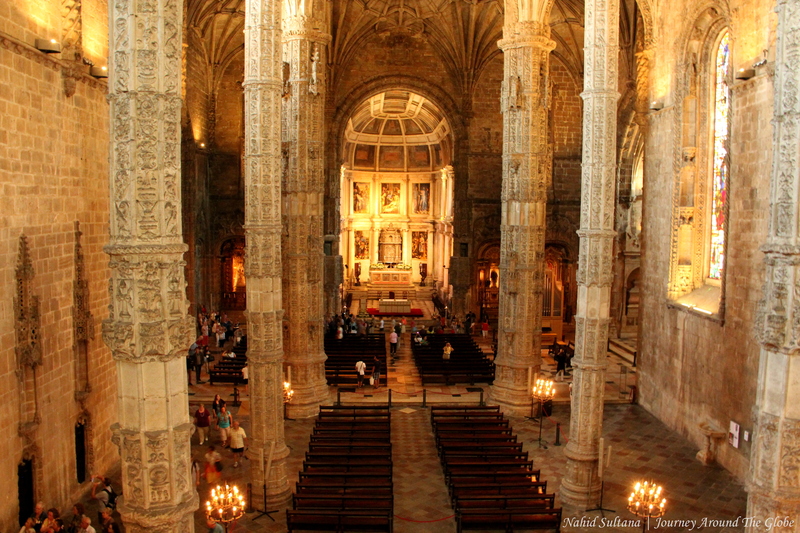 3) LISBON PATRIARCHAL CATHEDRAL or SANTA MARIA MAIOR: This is a historic cathedral of Lisbon since it was built by their first king, Dom Afonso Henriques during the later part of 12th century. This used to be the worship place for general publics. Though the architecture is very grand, interior is simply decorated. The cathedral is located in historic Alfama neighborhood, about 10 minutes of walk from St. George’s Castle. It’s open from 9 – 7 from Tuesday to Saturday and 9 – 5 on Mondays and Sundays. There is no charge to enter. 4) ROSSIO, CHIADO, BAIXA and WATERFRONT: Rossio, Chiado, and Baixa are the popular squares of Lisbon. They are all within walking distance of each other and are packed with many shops and restaurants. Rossio is the main meeting and gathering spot for locals and a beautiful one too. Chiado is more like an elegant shopping street close to Rossio, lined with many shops, bakeries, restaurants, and cafes. 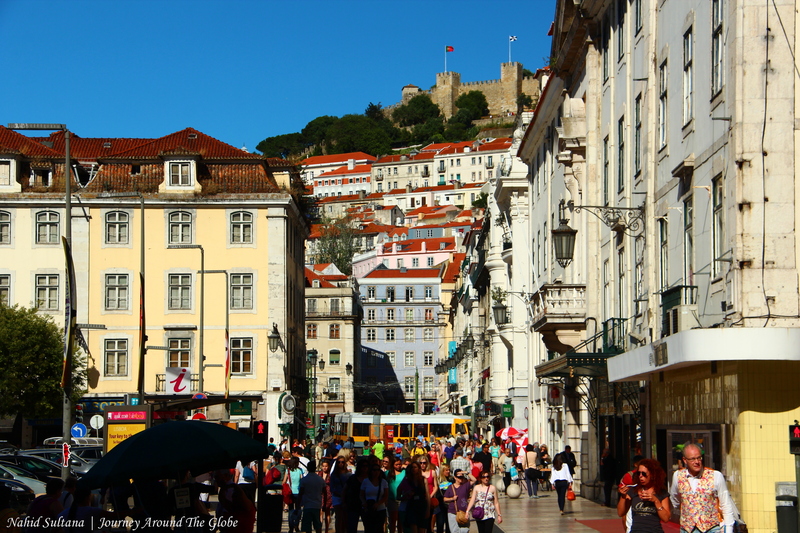 Walking on the cobblestone path, listening to live music on the street, and eating Pastei de Nata while doing window shopping (or real shopping) are just some of the things to do in Chiado. We went there twice and had tea-break in a bakery, called Eric Kayser. Baixa was a nice place just to sit down and enjoy the blue river at the end of our 1st day in Lisbon. The statue and arch that dominate Baixa square were under renovation, so we couldn’t see any part of those when we went there. So we just crossed a small street and sat down by the river before heading back to hotel. 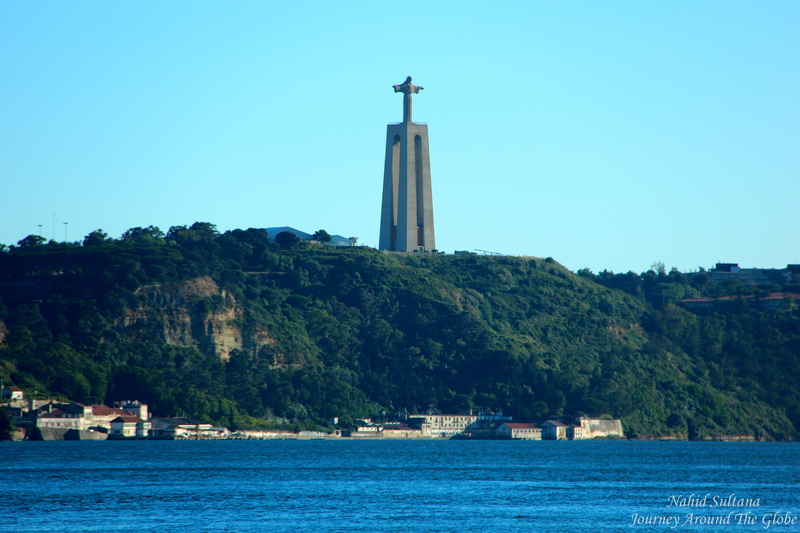 You can get a closer look of 25th April Bridge and Cristo Rei from Baixa than from top of St. George’s Castle. It’s very close to Chiado district and shouldn’t be missed. 5) JERONIMOS MONASTERY (MOSTEIRO dos JERONIMOS): This is another national monument of Lisbon from the 16th century and an UNESCO World Heritage Site. You can’t leave Lisbon without visiting Jeronimos Monastery. It was built to create a pleasant place of meditation and recreation for the monks. The cloister of it was finished in 1541. Due to its value and symbolism the Cloister is considered to be one of the jewels of the Manueline style. Stone curved vaulted ceilings, rope, plant motifs along with imagery of fantastic animals on the walls, and peaceful courtyard give its guests some inner-peace and tranquility. Few portions of the monastery still display old ceramic tiles on the walls. Two levels of Jeronimos Monastery is really very atmospheric and a perfect place to find yourself in a serene surrounding. There were some small displays and temporary/permanent exhibitions during our visit. But we didn’t go to any of them…we were busy enjoying the monastery itself. Church of this monastery comes before entering the ticket office. It’s dark and very gothic looking inside. It houses the tomb of famous Portuguese navigator, Vasco da Gama, who established the sea link between Portugal and India in the late 15th century. The monastery, #6, and #7 below are all located in Belem neighborhood. We took Lisbon’s historic tram # 15 to get here. Once we were there, everything is very close to each other. The cloister is open from October to April from 10 – 5:30 and from May to September from 10 – 6:30. It’s closed every Monday and public holidays. 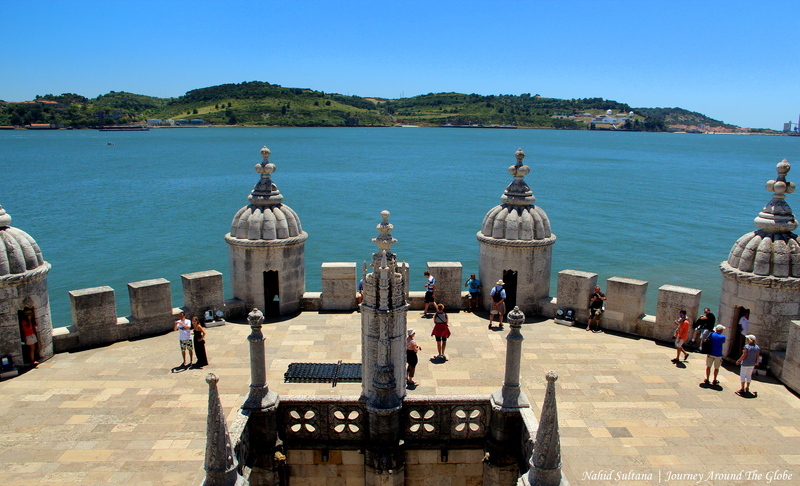 General admission to the monastery is 7 euros per adult and dual ticket of the monastery and Belem Tower is 10 euros. 6) MONUMENT of the DISCOVERIES: This is a riverside monument built in 1960 to commemorate the 500th anniversary of the death of Prince Henry the Navigator. Although we didn’t climb the top, we could tell it offers nice view of Lisbon and River Tagus. 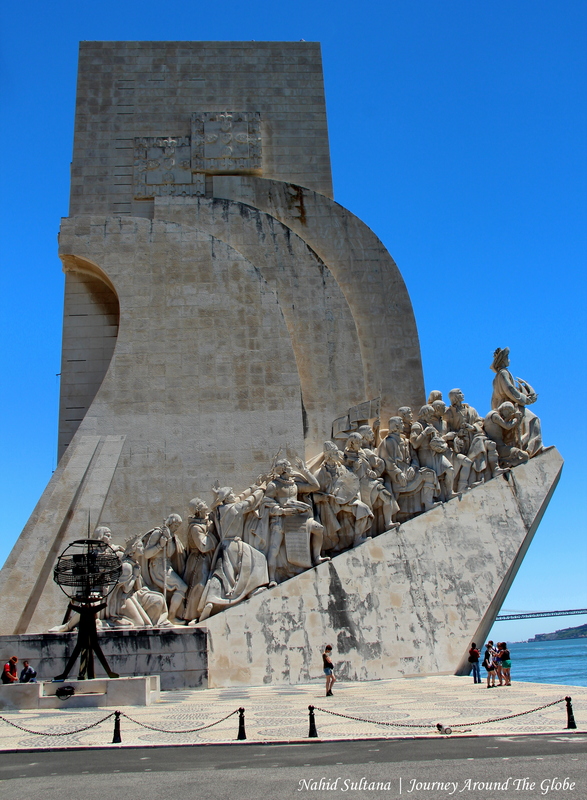 The entrance is shape of a sword and both sides of this monument have statues of Lisbon’s talented citizens who contributed in discoveries and science so far. 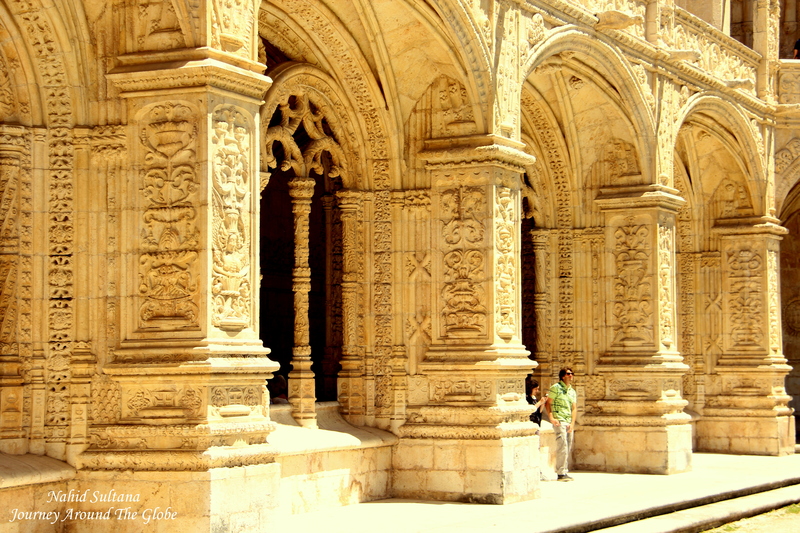 It’s located opposite of Jeronimos Monastery and right by Tagus River. There is also a map of all the places in the world where Portuguese had their maritime voyages and territory so far. Visitors can pay 3 euros to take an elevator on the top. 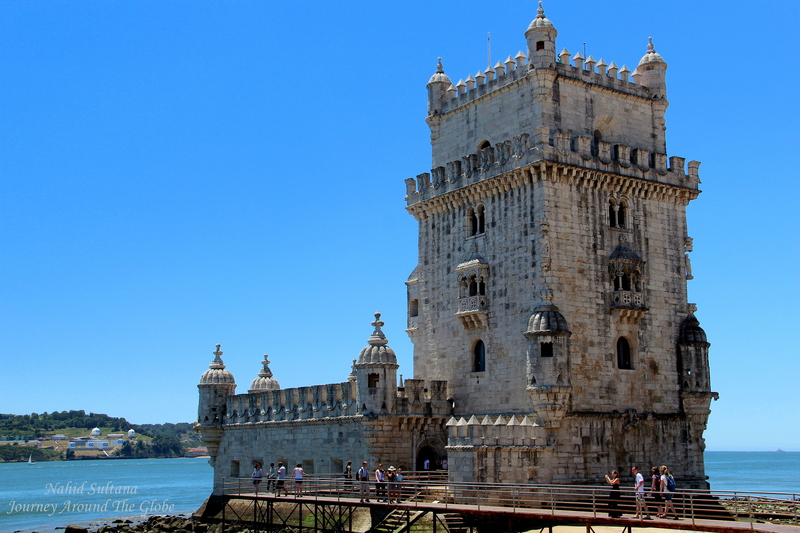 7) BELEM TOWER (TORRE de BELEM): This is a masterpiece of military tower in the Manueline style. The tower was built in the 16th century as a fortification for the defense of the Tagus River. 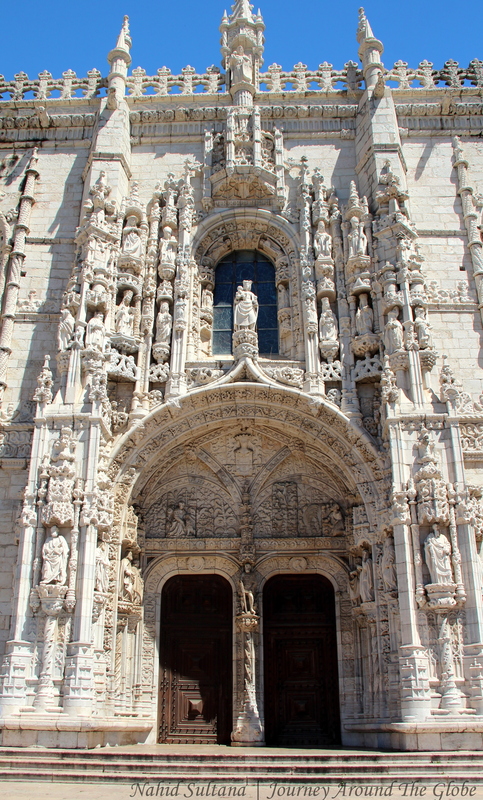 This is also a National Monument of Lisbon and an UNESCO World Heritage Site. Lower level of the tower has magazine storage and prison cell. Terrace and roof of the tower will give you a fantastic view of the river and its surroundings. Decoration of the tower is heraldic and very emblematic. There are 120 steps to go all the way to top of the tower. These steps are very narrow, twisty, and can be dangerous as the same stairs are used to go up and down. Belem Tower is also located by Tagus River and about 7/8 minutes of walk from Monument of the Discoveries. The tower is open for the visitors from 10 – 5:30 from October to April and from 10 – 6:30 from May to September. It’s closed every Monday and other public holidays. Combined ticket for Jeronimos Monastery and Belem Tower is 10 euros per adult. I do love Lisbon. I forget what a lovely city it is till wandering through your photos. I never managed to visit the Jeronimos monastery because I had my purse stolen and spent too much time in the company of the police. That can happen in any city. Some day I will return. Very pretty pictures 🙂 A fairytale destination indeed!